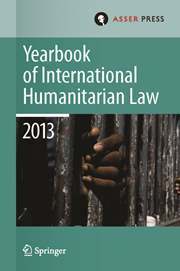 Now Published by Springer The Yearbook of International Humanitarian Law provides a truly international forum for high-quality, peer-reviewed articles, commentaries on current developments, reports on state practice, and documentation that have international humanitarian law as their focal point. All aspects of international law applicable during international and non-international armed conflicts are covered, in addition to interesting and significant developments in related fields, such as international peace and security, international criminal law, human rights law, disarmament law and refugee law, inter alia. Distinguished by its topicality and contemporary relevance, the Yearbook bridges the gap between theory and practice and serves as a useful reference tool for scholars, practitioners, military personnel, civil servants, diplomats, human rights workers and students.